What do they want from us?! 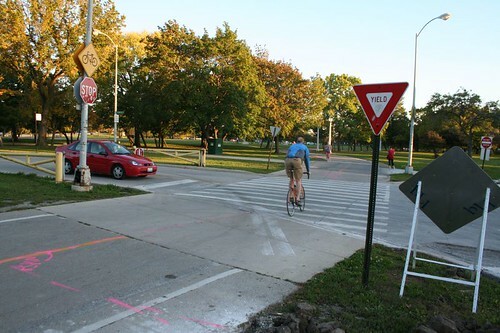 The intersection of the lakefront bike trail and Lawrence Avenue bemuses me every time I pass it. The cars have a stop sign. The bikes have a yield sign. But if the cars are stopped, what are we supposed to yield to? If we have to yield, shouldn’t that grant the cars the right-of-way? All this ignores the fact that most bikes hardly even slow down for these intersections. I don’t recall if it was this one or one similar by the lake but my father almost did hit someone on a bike at this type of intersection a couple of years ago. He made his stop but the guy he almost hit did not stop nor look to even see the car moving. I’m just glad that they’re repaving them; they have horrible bumps between Montrose and Foster. This is a bizarre situation though; I think it’s lip service to motorists. A bigger problem is motorists not stopping and yielding to pedestrians at stop signs – I live near an intersection where I’ve seen god know how many close calls – at the intersection of two narrow residential streets no less. I do a lot of cycling and I encount kind of thing so many timesa! The people who put the signs up have no interest in the cyclists!